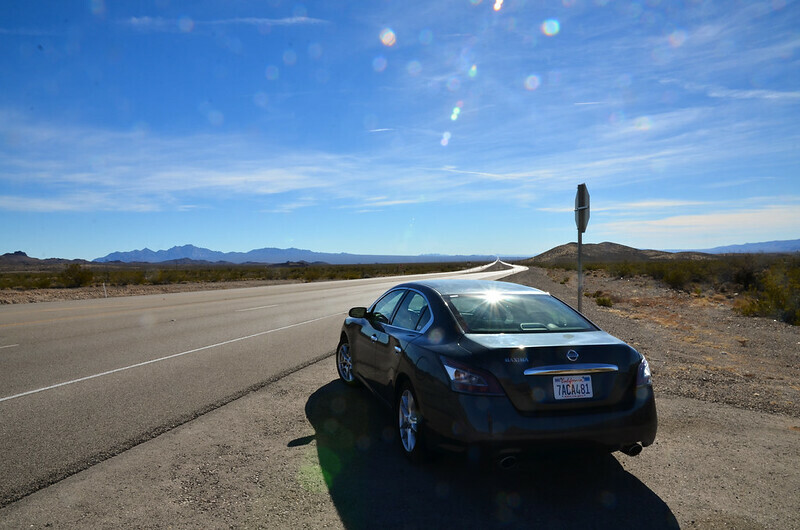 A couple of years ago I found myself with three days to kill in Southern California, so I rented a car and circled around – passing through the Coachella Valley and Palm Springs along the way. It seemed like a nice little town, but I didn’t really have time to stick around – instead I hit the (beautiful) road back to San Diego the next morning. This year, however, three of us found ourselves in Las Vegas (CES 2014, work), and with the time and money to rent a car – so we headed back to Coachella with a vague plan to rent some bikes (we all cycle) and explore. For anyone planning a similar trip, here’s what worked, and what didn’t. I picked up a rental car from the LV strip: pre-booked, this fairly massive vehicle (Nissan Maxima) cost about £40 a day. The obvious way to and from Palm Springs from Las Vegas is down the Interstate 15, but we decided to make a circular route and instead drive South down route 95, cutting off slightly to visit Lake Havasu City (and check out London Bridge) along the way, before taking the Interstate 10 west. Two things about this plan. For one, it’s a pleasant – if slightly long – way to drive, with some beautiful scenery along the way. I’m glad we did it. 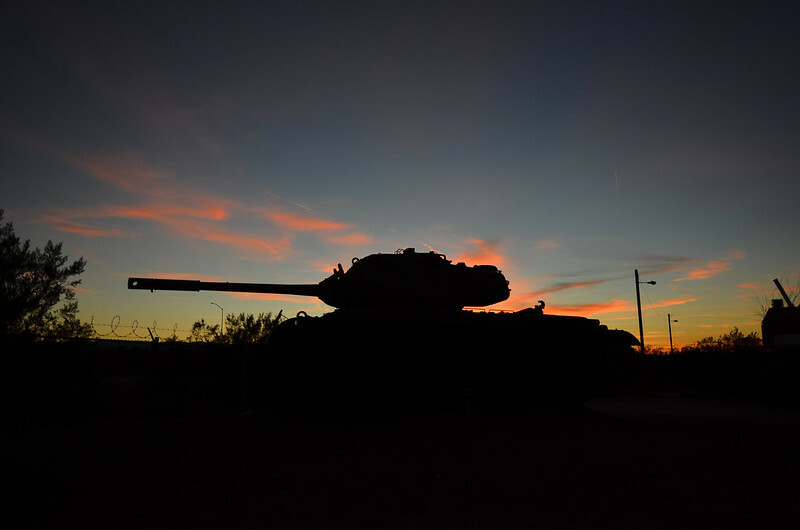 As well as the desert and rocks we passed old mining towns, beautiful lakes and – to our surprise – a museum dedicated to General Patton. The drive will take you most of a day; we pulled into Palm Springs in the dark. The other thing to note is that it’s probably not worth detouring via Lake Havasu City. On the plus side it does indeed hold London Bridge, which is worthy of a raised eyebrow, and an In-n-Out Burger. On the other hand, it adds quite a few miles to the route – I’d carry straight on South next time. Last time in Palm Springs I stopped at the Alpine Gardens Motel. It’s now under new management, and being renamed Cody’s Inn – and for three people it would have been pretty expensive, so we decided to save money to spend on food, beer and bikes, and stay at a Motel 6 instead. This turned out to be a great decision – the Palm Springs Downtown site is stupidly cheap, perfectly good and within a five minute walk of the town centre. Boutique it ain’t, but I’d recommend it. Two places to recommend here. First, Bill’s Pizza – really great American-style pizza, and an even better range of proper beers on tap (currently Stone IPA, Anchor Steam, and a whole load of other good stuff). Great beer, pizza, friendly staff, and some kind of insane system for getting to the toilets that involves a giant spoon (really). Go there. Then go again. Secondly, Sherman’s Deli. In the morning, a great place to get breakfast or just some ludicrously huge pastries to take away with you. In the evening, proper deli food – think brisket, latkes, vegetables, chicken soup. And they even had some decent beer. Oh, and if you need your fix of proper Euro-strength coffee: Espresso Cielo, on the main street. If you want to buy a bike in Palm Springs, you’re in luck: the Palm Springs Cyclery (right opposite our motel) is fantastic, with really helpful staff – so helpful, in fact, that they even let three trade-show-deranged British guys take a $6,000 Specialized Turbo for a spin*. If you want to rent a bike, things aren’t quite so great. The guys in the shop recommended a company who hired out mountain bikes, but sadly they turned out to be based out of town, pretty expensive and not able to drop the bikes off at a trailhead (so we would have had to cram three in the rented Maxima). With that in mind, we decided to stick to car and foot. First, to Joshua Tree National Park. Joshua Tree is huge. 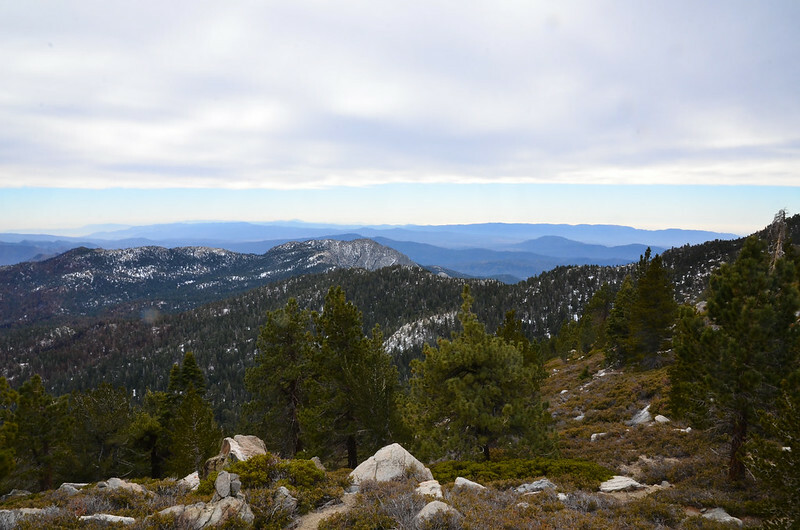 It’s a decent drive out from Palm Springs, and once you get in you’ll do plenty more driving down the impeccably-surfaced roads that run between various locations for hiking, camping and so on. We took a stroll around Hidden Valley (above), and clambered on the Jumbo Rocks before driving up to get a view over the entire valley. 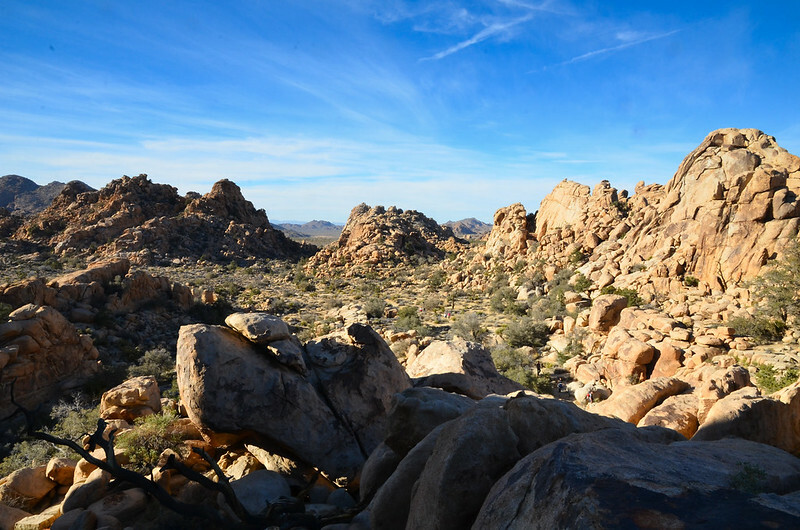 Taken in this way, by car, you can happily bumble around Joshua Tree for a day – or in our case, half that. If you have any more time you’d want to come prepared for hiking, bouldering or climbing. If I did it again I’d be tempted to camp overnight – the organised campgrounds are busy, but with some great views. 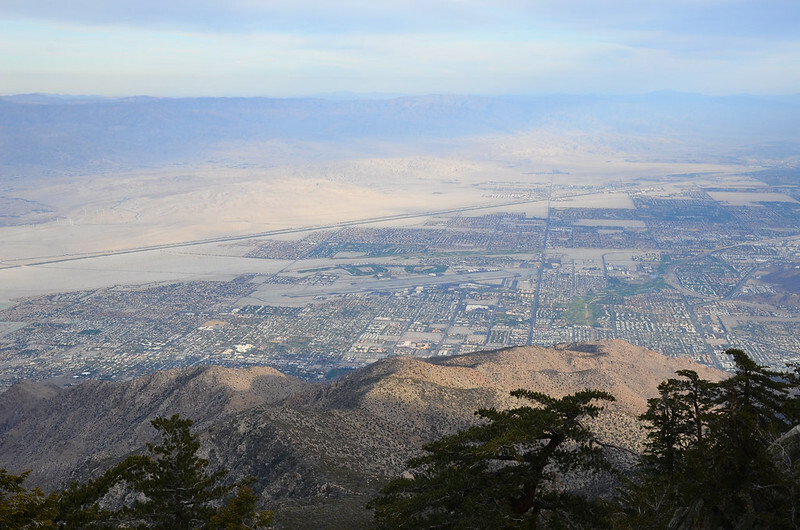 We wanted to hike, but were less keen on the desert sun (especially after a week locked in a convention centre), so instead decided to set out for a walk at the San Jacinto State Park – right up at the top of the Palm Springs cablecar, and in the forest. Last time I visited, I’d had little time to spend at the top and was entirely underdressed for hiking. This time we arrived early, packing food, water and clothes, and visited the ranger station to get a map and permit. 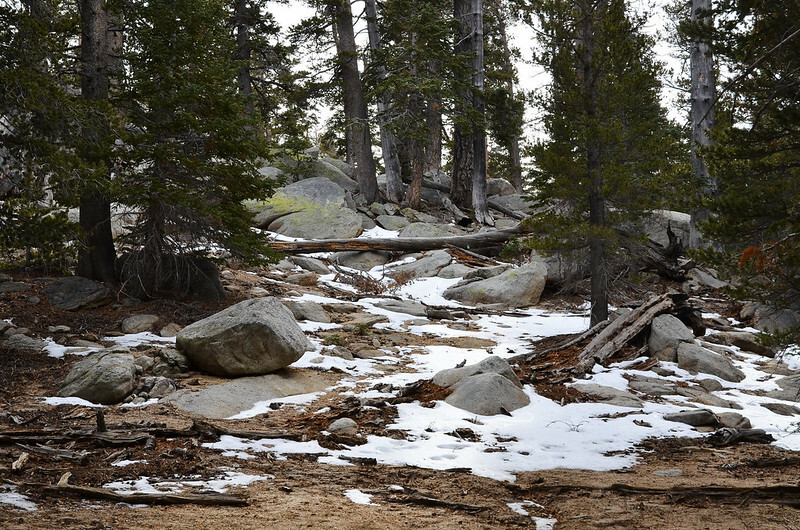 The trails are really well marked, making progress easy, and the weather was great, with just a bit of snow left on the ground as we hiked up. .. after which we circled around, following a different route back to the ranger station and the cable car down. If you’re able to walk at a decent pace uphill, it’s a great short hike that’ll take the middle part of a day, getting you back well before sunset. Even if you haven’t got time to hike, the view down from the cable car station’s pretty impressive. And that was about it for us. One long drive back down the I15, one tedious flight and back home. 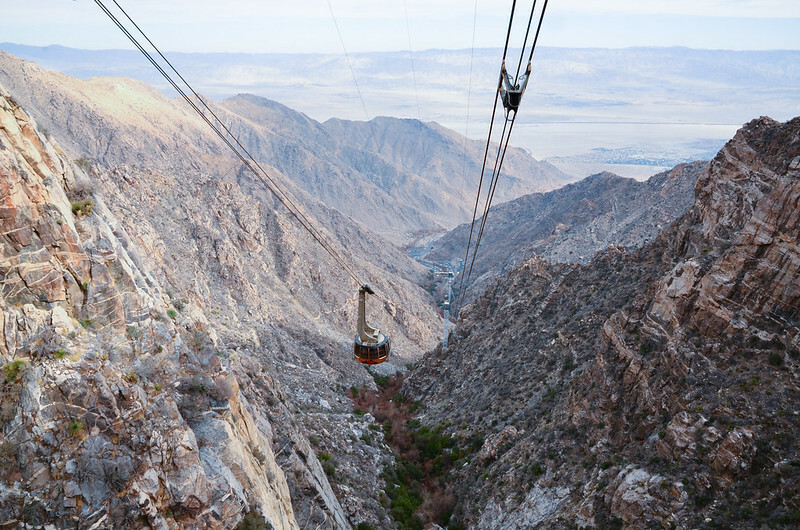 But if you find yourself near Palm Springs, do go – eat the pizza, drink the beer, walk in the mountains, feel better. It’s the antidote to Vegas. I took loads more photos, especially in San Jacinto and Joshua Tree. They’re all here. * It’s crazy. I want one. Good thing they don’t sell them here.